Deutsche Luft Hansa AG was founded in 1926 in Berlin. In 1953 a company called Aktiengesellschaft für Luftverkehrsbedarf (Luftag) was founded in Cologne, with many employees who had worked in the former Lufthansa. It was ordered four Convair CV-340 and four Lockheed L-1049 Super Constellation and established a maintenance base at Hamburg airport. One year later, Luftag bought the brand and the name Deutsche Lufthansa for 30,000 DM, thus continuing the tradition of a German flag carrier with the same name. On 1 April 1955 Lufthansa got approval to start scheduled domestic flights, linking Hamburg, Düsseldorf, Frankfurt, Cologne, and Munich. International flights had started on May 15, 1955 to London, Paris and Madrid, followed by the Super Constellation’s flight to New York on June 1 and by all the South Atlantic from August 1956. In August 1958, 15 Lockheed L-1049 Super Constellation and Lockheed L-1649 Starliner left Germany each week to Canada and United States. Three L-1049 Super Constellation were flying to South America, three for Tehran and one for Baghdad. The jet’s era began in 1956 when the company signed a letter of intent for purchasing of four Boeing 707. A few months passed when Lufthansa began a study called “Paper Jet” to simulate flights of aircraft over the North Atlantic. Officially on March 2, 1960 the company entered the jet’s era with the landing of its first Boeing 707 in Hamburg. On March 17, the airline started the 707 flights over the North Atlantic. 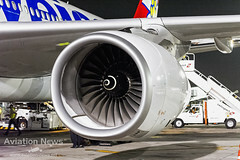 In the following year the aircraft began operations to Asia – Bangkok, Hong Kong and Tokyo. To complement the fleet, the Boeing 720B began the service on May 20, 1961 – a smaller long-range version of the 707. The first Boeing 727 lands at Hamburg airport on March 21, 1964, named “Europe Jet” by the Lufthansa’s marketing department, easily defined by its high vertical stabilizer and three engines in the rear fuselage. In the same year, the company started the polar route to Tokyo (via Anchorage) with this new airplane. Later on February 19, 1965, the company became the launch customer of the Boeing 737 and order 21 units, entering service in 1968. The technical concept has been significantly influenced by the Lufthansa’s engineering team. In addition of becoming the 737’s launch customer, Lufthansa became the first foreign launch customer of a Boeing airliner. On June 27, 1966 the famous era of the wide-body jets started in the company with an order of three Boeing 747-100. In the following year, on October 06, the Super Constellation operated its last scheduled flight for Lufthansa. The Boeing 737 commences scheduled services with Lufthansa. Dubbed the “City Jet”, it rapidly establishes short haul services. Lufthansa received its first Boeing 747-100 that landed in Frankfurt on March 09, 1970. On April 26, the company started the planned operations for the 747. It was Lufthansa’s first aircraft that have a flight entertainment system for the passengers. The airline was the first European company to take the Jumbo jet into service in 1970. On April 19, 1972, the company became the first airline to operate the freighter version of the Boeing 747-200. Two years later, Lufthansa began the operation of its first McDonnell-Douglas DC 10. It was used on long range routes for which the Boeing 747 would be uneconomic. For the first time, Lufthansa order an Airbus aircraft. In June 1975 the company ordered three A300 with an option for another nine units. In the subsequent year, Lufthansa received its first A300 at the Airbus factory in Hamburg. 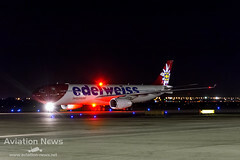 In April the company started operating the A300 to routes within Germany and Europe. The first non-stop flight from Frankfurt to Los Angeles was performed on April 3, 1977 due to the fact of a 747 SL equipped with special long-range tanks. In the same year, a large modernization program of the company’s fleet is approved. A total of over one billion DM, six 727, five 747 with an option for four more units were ordered. On the following year, Lufthansa took a share in regional carrier DLT, later renamed Lufthansa CityLine. In 1979 more purchases were made now with an order for 32 Boeing 737-200 Advanced and options for 25 units more. Also, another Airbus order were made, now for 25 A310 with options for 25 units more of this type. Later the first Boeing 737-200 Advanced was delivered, with the total orders for this aircraft of 36 units. 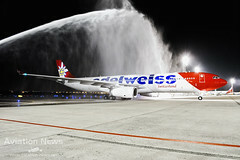 Airbus handed over the first A310 aircraft in Toulouse to launch customers Lufthansa and Swissair. The last flight of the Boeing 707 was scheduled for December 31, 1984. More orders were made in 1985. At that time 33 aircraft were ordered and 38 options are made. The models chosen were Airbus A320, Airbus A300-600, Boeing 737-300 and Boeing 747-200. On June 23, 1986 six Boeing 747-400 were ordered with an option for nine more units. The pioneering did not stop. In the year of 1987 Lufthansa became the launch customer of the Airbus A340 with 15 units ordered plus an option for more 15 units. Firm orders for 20 Boeing 737-300 and 737-500 were performed in 1988, with an option for 20 aircraft. The first delivery of Boeing 747-400 happened in 1989, thus providing new routes and a greater comfort for the passengers. On 22 September, the company ordered 22 Airbus A321, with an option for another 20 aircraft. Days later, the first A320 entered in service. In order to expand and modernize the fleet, more orders were made. At that time the models chose were the Airbus A310, Airbus A320, Boeing 737-500 and Boeing 747-400. Airbus presents the long-range A340, whose design was strongly influenced by Lufthansa as the launch customer. The Boeing 727 flew for Lufthansa for the last time on October 4, 1992. In March 1993, the Airbus A340 entered in service with Lufthansa. On the following year the company received its first A321 on 27 January. In December 1994 it was the last time that McDonnell Douglas DC-10 flew for Lufthansa. Star Alliance, the first multilateral airline alliance in the world was created in Frankfurt in May 1997. On 06 December 2001, Lufthansa announced an order for 15 Airbus A380, with 10 more options, which was confirmed on 20 December. The A380 fleet would be used for long haul flights from Frankfurt exclusively. In June 2003, Lufthansa opened Terminal 2 at Munich’s Franz Josef Strauss Airport to relieve its main hub, Frankfurt, which was suffering from capacity constraints. It was one of the first terminals in Europe partially owned by an airline. On 01 December, 2004, Lufthansa was the first airline to open a terminal specifically for the First Class, the famous First Class Terminal (FCT) in Frankfurt. Demonstrating its pioneerism again, Lufthansa was the launch customer of the Boeing 747-8 Intercontinental. The airline ordered 20 units of the aircraft in December 6, 2006. The company was the second European airline to operate the Airbus A380. Their first A380 was delivered on May 19, 2010, while their first 747-8I entered in service in 2012. The classes have been updated, the new award-winning First Class was debuted in the Airbus A380. The new Business Class and the new Economy Class were debuted in the new Boeing 747-8I in 2012. In 2012 Lufthansa announced a restructuring program called SCORE to improve its operating profit. 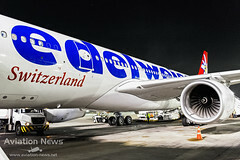 As a part of the restructuring plan the company started to transfer all short-haul flights outside its hubs in Frankfurt, Munich and Düsseldorf to the company’s re-branded low-cost carrier Germanwings. The year of 2013 was a year of new orders for Lufthansa. With an order of 59 aircraft that worth more than 14 billion euros. The models chosen were the Airbus A350-900 (25 aircraft) and the Boeing 777-9X (34 aircraft). On 2014, Lufthansa introduced a new class of travel with its Premium Economy Class for the first time in 35 years. It was part of the largest product upgrade in the history of this company. With a pioneering history and being one of the driving forces of the 747 program from the beginning, Lufthansa received in the last year the 1.500th Boeing 747 produced (D-ABYP). To celebrate the World Cup in 2014, the company changed the famous logo of some aircraft to “Fanhansa”, as a tribute to football fans. In 2015, with the celebration of 60 years since its reformation, Lufthansa painted one of its Boeing 747-8I (D-ABYT) with the retro painting of its aircraft in 1970. Up to 2025, Lufthansa expects to receive its 263 aircraft ordered. This order has a market value of 42.2 billion dollars. All media of this article is courtesy of Deutsche Lufthansa. A Deutsche Luft Hansa A.G. foi fundada em 1926, na cidade de Berlim. No ano de 1953, uma empresa chamada Aktiengesellschaft für Luftverkehrsbedarf (Luftag) com sede em Colonia, com muitos funcionários que haviam trabalhado na antiga Lufthansa, encomendou quatro Convair CV-340 e quatro Lockheed L-1049 Super Constellation e estabeleceu uma base de manutenção no aeroporto de Hamburgo. Um ano após, a Luftag comprou esta marca e o nome Deutsche Lufthansa por 30 mil marcos. Assim, continuou a tradição de uma transportadora de bandeira alemã com o mesmo nome. No dia primeiro de abril de 1955 a Lufthansa obteve aprovação para iniciar os seus voos domésticos programados conectando Hamburgo, Düsseldorf, Frankfurt, Colonia e Munique. Os voos internacionais iniciaram-se em 15 de maio de 1955 para Londres, Paris e Madri, seguidos pelos voos do Super Constellation para Nova York em 01 de junho e, por todo Atlântico Sul, a partir de agosto de 1956. Em agosto de 1958, 15 Lockheed L-1049 Super Constellation e Lockheed L-1649 Starliner partiam da Alemanha a cada semana para o Canadá e Estados Unidos. Três L-1049 Super Constellation voavam para a América do Sul, três para Teerã e um para Bagdá. A era dos jatos começou em 1956 quando a companhia assinou uma carta de intenção para a compra de quatro Boeing 707. Alguns meses se passaram quando a Lufthansa iniciou o estudo denominado “Paper Jet” para simular voos de aviões sobre o Atlântico Norte. Oficialmente em 02 de março de 1960 a empresa entrou na era dos jatos com o pouso do seu primeiro Boeing 707 em Hamburgo. Dias se passaram até que em 17 de março houve o início dos voos do 707 sobre o Atlântico Norte. No ano seguinte a aeronave iniciou as operações para Ásia – Bangcoc, Hong Kong e Tóquio. Para complementar a frota, o Boeing 720B, uma versão menor de longo alcance do 707, entra em serviço na Lufthansa em 20 de maio de 1961. Em 21 de março de 1964 o primeiro Boeing 727, nomeado “Europa Jet” pelo departamento de marketing da Lufthansa, aterrissou no aeroporto de Hamburgo e foi facilmente caracterizado pelo seu alto estabilizador vertical e três motores na fuselagem traseira. No mesmo ano, a companhia iniciou a rota polar para Tóquio (via Anchorage) com este novo avião. Posteriormente em 19 fevereiro de 1965, a empresa tornou-se cliente lançador do Boeing 737 e encomendou 21 unidades que entraram em serviço em 1968. O conceito técnico desta aeronave foi significativamente influenciado pela equipe de engenharia da empresa. Além de se tornar o cliente lançador do 737, a Lufthansa se tornou o primeiro cliente lançador estrangeiro de um avião de passageiros da Boeing. Assim, iniciou-se em 27 de junho de 1966 a era dos famosos “wide-body jets” na empresa com um pedido de compra de três Boeing 747-100. No ano seguinte, em 06 de outubro, o Super Constellation realizou seu último voo programado pela Lufthansa. O Boeing 737 começou a ser operado pela companhia em 10 de fevereiro de 1968. Apelidado de “City Jet”, rapidamente estabeleceu os voos de curta distância da empresa. A Lufthansa recebeu o primeiro Boeing 747-100 que aterrissou em Frankfurt em 09 de março de 1970. Em 26 de abril a empresa iniciou as operações programadas para o 747. Foi a primeira aeronave da Lufthansa a ter um sistema de entretenimento de bordo para os passageiros. Em 1970, a Lufthansa tornou-se a primeira companhia aérea europeia a operar o novo avião que chamavam de Jumbo. Em 19 de abril de 1972, a empresa se torna a primeira companhia aérea a operar a versão cargueira do Boeing 747-200. Dois anos após, a Lufthansa iniciou a operação do seu primeiro McDonnell-Douglas DC 10. Ele foi utilizado em rotas de longo alcance para as quais o Boeing 747 não teria viabilidade econômica. Pela primeira vez, a Lufthansa encomendou aeronaves da Airbus. Em Junho de 1975 a empresa encomendou três A300 com opção de compra para outras nove unidades. No ano seguinte, a Lufthansa recebeu o seu primeiro A300 na fábrica da Airbus, em Hamburgo. No mês de Abril, a empresa iniciou a operação do A300 para rotas na Alemanha e Europa. O primeiro voo non-stop de Frankfurt para Los Angeles foi realizado em 03 de abril de 1977 graças a um Boeing 747 SL equipado com tanques para voos de longo alcance. No mesmo ano, um grande programa de modernização da frota da empresa foi aprovado. No total de mais de um bilhão de marcos, foram encomendados seis 727 e cinco 747 com opção para mais quatro unidades. No ano seguinte a Lufthansa passou a ter participação na transportadora aérea regional DLT, mais tarde renomeada para Lufthansa CityLine. Em 1979, mais encomendas foram feitas, agora com um pedido para 32 Boeing 737-200 Advanced e opção para mais 25 unidades. Além disso, outra encomenda à Airbus foi feita, agora para 25 A310 com opção para mais 25 unidades deste tipo. Posteriormente o primeiro Boeing 737-200 Advanced foi entregue, totalizando uma encomenda de 36 unidades para esta aeronave. A Airbus entrega na sua fábrica em Toulouse o primeiro A310, no ano de 1983, para os seus dois clientes lançadores, Lufthansa e Swissair. O último voo do Boeing 707 pela Lufthansa foi realizado em 31 de dezembro de 1984. Mais encomendas de outras aeronaves foram feitas em 1985, desta vez 33 aeronaves foram encomendadas e 38 opções de compra foram feitas. Os modelos escolhidos foram Airbus A320, Airbus A300-600, Boeing 737-300 e Boeing 747-200. Em 23 de junho de 1986, o Boeing 747-400 foi encomendado com pedidos para seis aeronaves com opção para mais nove unidades. O pioneirismo não parou ai. No ano de 1987 a Lufthansa se tornou o cliente lançador do Airbus A340 com 15 unidades pedidas e mais 15 opções de compra. Pedidos firmes de 20 Boeing 737-300 e 737-500 foram realizados em 1988, com uma opção para 20 aeronaves. A primeira entrega do Boeing 747-400 aconteceu em 1989, possibilitando desta forma novas rotas e maior conforto aos passageiros. No dia 22 de setembro, a empresa encomendou 22 Airbus A321, com uma opção para mais 20 aeronaves. Dias depois, o primeiro A320 entrou em serviço. Visando a ampliação e modernização da frota, mais ordens e pedidos foram feitos. 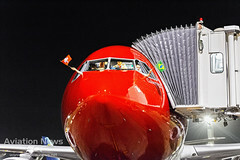 Desta vez, os modelos escolhidos foram o Airbus A310, Airbus A320, Boeing 737-500 e Boeing 747-400. A Airbus apresenta o A340 de longo alcance cujo projeto foi muito influenciado pela Lufthansa como o cliente lançador. A última vez que o Boeing 727 voou pela Lufthansa, foi em 04 de outubro de 1992. Em março de 1993, o Airbus A340 entrou em serviço com a Lufthansa. No ano posterior, foi a vez da empresa receber o seu primeiro A321 em 27 de janeiro. No mês de dezembro de 1994 o último McDonnell-Douglas DC 10 voou pela Lufthansa. A Star Alliance, a primeira aliança multilateral de companhias aéreas do mundo, foi criada em Frankfurt em maio de 1997. Em 6 de dezembro de 2001, a Lufthansa anunciou uma encomenda de 15 Airbus A380, com mais 10 opções, o que foi confirmado em 20 de dezembro. A frota A380 passou a ser usada para voos de longo curso, a partir de Frankfurt exclusivamente. A Lufthansa inaugurou o Terminal 2 do Aeroporto Franz Josef Strauss de Munique para aliviar seu principal hub, Frankfurt, que estava sofrendo de restrições de capacidade em junho de 2003. Foi um dos primeiros terminais na Europa partilhado com uma companhia aérea. Em 01 de dezembro de 2004, a Lufthansa foi a primeira companhia aérea a abrir um Terminal especificamente para a Primeira Classe, o famoso First Class Terminal (FCT) em Frankfurt. Novamente com seu pioneirismo, a Lufthansa foi o cliente lançador do Boeing 747-8 Intercontinental fazendo um pedido de 20 unidades da aeronave em 06 de dezembro de 2006. A empresa foi a segunda companhia aérea européia a operar o Airbus A380. O seu primeiro A380 foi entregue em 19 de maio de 2010, enquanto o seu primeiro 747-8I entrou em serviço em 2012. As classes foram atualizadas. A premiada nova Primeira Classe estreou no Airbus A380. A nova Classe Executiva e a nova Classe Econômica vieram no novo Boeing 747-8I em 2012. Também em 2012, a Lufthansa anunciou um programa de reestruturação chamado SCORE para melhorar seu lucro operacional. Como parte do plano de reestruturação, a empresa começou a transferir todos os vôos de curta distância para fora de seus centros de conexões em Frankfurt, Munique e Düsseldorf para uma companhia aérea subsidiária sua, de baixo custo, a Germanwings. O ano de 2013 foi um ano de novos pedidos para a Lufthansa. Com a encomenda no valor de 14 bilhões de euros de 59 aeronaves. Os modelos escolhidos foram o Airbus A350-900 (25 aeronaves) e o Boeing 777-9X (34 aeronaves). No ano de 2014, a Lufthansa introduziu uma nova classe de viagem com a sua nova Classe Econômica Premium, pela primeira vez em 35 anos. Isto foi parte da maior atualização de produto na história da Lufthansa. Com uma história pioneira e sendo uma das forças motrizes do Programa 747 desde o início, a Lufthansa recebeu no ano passado o 1.500º Boeing 747 produzido (D-ABYP). Para comemorar a Copa do Mundo de 2014, a companhia trocou a famosa logo de algumas aeronaves para “Fanhansa”, uma homenagem aos fãs do futebol. Em 2015, com a comemoração aos 60 anos de sua reformação, a Lufthansa pintou um de seus Boeing 747-8I (D-ABYT) com a sua pintura retro de suas aeronaves no ano de 1970. Até 2025, a Lufthansa espera receber suas 263 aeronaves encomendadas que possuem um valor de mercado de 42.2 bilhões de dólares. Toda a mídia deste artigo é cortesia da Deutsche Lufthansa. This entry was posted in General Aviation, Specials and tagged Airbus, Airbus A320 family, Airbus A350 family, Airbus A380 family, Aircraft, Airlines, Aviation, Aviation News, Boeing, Boeing 747, Boeing 747-400, Boeing 747-8 Intercontinental, Business, Business Class, First Class, Frankfurt, Germany, Lufthansa, Lufthansa Group, Miles, Star Alliance. Bookmark the permalink.